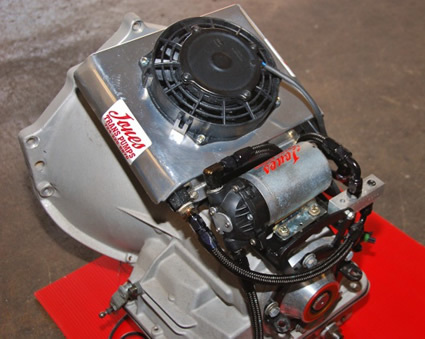 The Jones Trans Pump utilizes your current transmission pan and transmission cooler to provide the consistent transmission fluid temperature that gives you the winning edge. When the system is activated the fluid is pumped from the bottom of the pan through the cooler and back into the inlet on the transmission case. This flow of cooled fluid not only cools the fluid in the pan but more importantly cools the internal transmission components. The image shows the Jones Trans Pump System installed on a shorty glide. The system requires no internal drilling or lines in the transmission.